You may have to visit a specialty shop to find mung dal (split yellow lentils), masoor dal (split red lentils), and asafetida, but once you've stocked up, you won't be far from this classic Indian comfort food. Using a pressure cooker makes it fast and easy to prepare for a crowd. 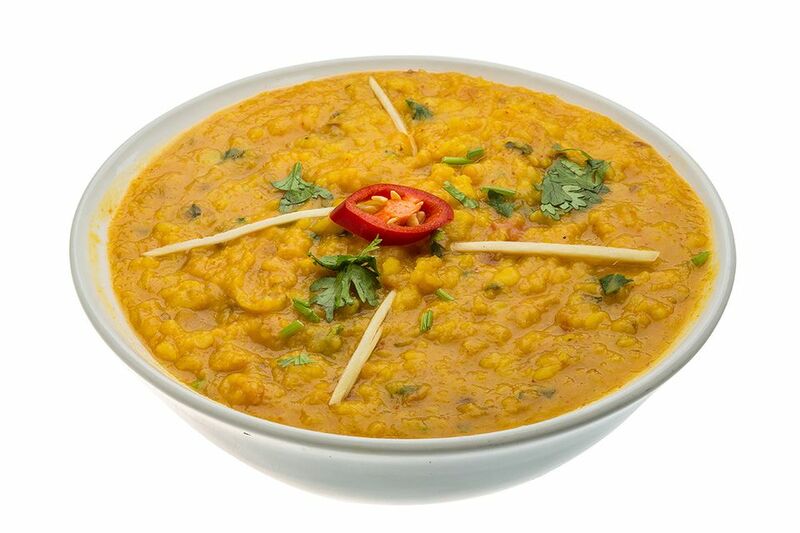 Served as a healthy entrée, this masala dal goes just as well with hot chapatis as it does with plain rice. Throw in a salad or a vegetable side dish and you've got the perfect vegetarian meal! Mix the two washed dals together in a pressure cooker and add enough water just to cover. Add the asafetida,1/2 tsp. each of turmeric and red chili powder, and salt to taste. Cover and set up to cook on a medium flame. Allow one whistle/pressure release and reduce flame to simmer. Cook until you hear two more whistles/pressure releases and turn off. Keep aside without opening the pressure cooker. Heat the cooking oil in a deep, heavy-bottomed pan on a medium flame. Add the onions and fry till translucent. Add the tomatoes, ginger, and garlic. Fry till the tomatoes are soft and pulpy. Add all the powdered spices: coriander, cumin, sambar masala, and the remaining 1/2 tsp of turmeric and red chili powder. Mix well and fry for 5 to 7 minutes. Release the steam and open the pressure cooker. Add the boiled dals to the spice and tomato mixture and blend well. Season with salt if necessary. Cook for 10 minutes on a medium flame, stirring occasionally. In another small pan, heat the ghee on a medium flame until quite hot. Add the paanch phoran, curry leaves, and green chilies and fry for 2 to 3 minutes, or until the mixture stops spluttering. Stir often. Turn off the heat and add the ghee mixture to the dal. Stir well. Garnish with chopped coriander leaves and serve hot with chapatis or plain boiled rice.